Seven-night, year-round cruises are the most common option in both regions. Eastern routes sail from ports in Florida or from ports along the East Coast. Western itineraries sail from Florida or Texas, and sometimes New Orleans. If you prefer visiting as many ports as possible, go for Eastern Caribbean sailings that depart from San Juan or St. Thomas — the time you would have spent sailing from Florida is made up by stopping at five or six islands. Western Caribbean routes, on the other hand, rarely stop at more than four ports. Our Pick: Draw. Different strokes for different folks. Western routes are best for history and nature, and Eastern ones rank high for beach hopping. You’ll find good shores on both routes: Jamaica’s Negril and Grand Cayman’s Seven Mile Beach in the West, and too many to count in the Eastern Caribbean’s British and U.S. Virgin Islands, especially the perfect strips of white sand on Jost Van Dyke and St. John. The East’s tiny islands of St. Barts, Les Saintes, and Anguilla are also home to drop-dead gorgeous coastlines. Our Pick: Eastern. This is a close one, but we’re going with the Eastern Caribbean due to its quantity of gorgeous strands. If you need more than sunbathing, shopping, and bar hopping, then the Eastern Caribbean itineraries might seem limiting to you. Yes, you can work up a sweat ziplining in St. Martin or kayaking off the coast of Tortola, but generally speaking, Eastern routes offer less to do beyond beaches and water sports. Western Caribbean cruises are well rounded: In Mexico you can explore pre-Columbian temples or tube through underwater caves. Scuba dive off the shore of Grand Cayman where dramatic underwater cliffs attract abundant sea life, or try horseback riding through the surf in Jamaica, an island with a tradition of horse racing. Our Pick: Western. You can crawl around ancient ruins, go bobsledding, and tour coffee plantations — all on a one-week cruise. Most children love anything to do with beaches — playing in the sand, riding waves, and taking banana boat rides. Both Eastern and Western Caribbean itineraries offer great coastlines. The Western Caribbean, though, has more than great beaches: Mexico’s Mayan ruins, snorkeling and diving along the coast of Belize, and climbing near natural features like Jamaica’s Dunn’s River Falls. The Eastern Caribbean boasts a few outliers, including the awesome El Morro fortress in Old San Juan, but otherwise, the region is mostly about sand and shopping. Our Pick: Western. Among the water parks, rivers, and coral reef, these ports are ideal, especially for families traveling with active kids. Both regions have downsides: The Western’s Grand Cayman can be a dud, as the port is canceled fairly frequently due to heavy winds and surf (ships anchor and shuttle passengers ashore via tender boats), and Jamaica is notorious for vendors with aggressive sales tactics. Meanwhile, St. Thomas and St. Martin on Eastern routes can see more than 10,000 cruise passengers in town at the same time, causing epic traffic jams. Our Pick: The Eastern Caribbean has fewer downsides. If there are only three or four ports on a weeklong Western Caribbean cruise and one is canceled, that’s a bummer. Our Pick: Western. The Western Caribbean is more of a smorgasbord than the Eastern, so our vote goes for variety. See the best deals on Western Caribbean cruises! 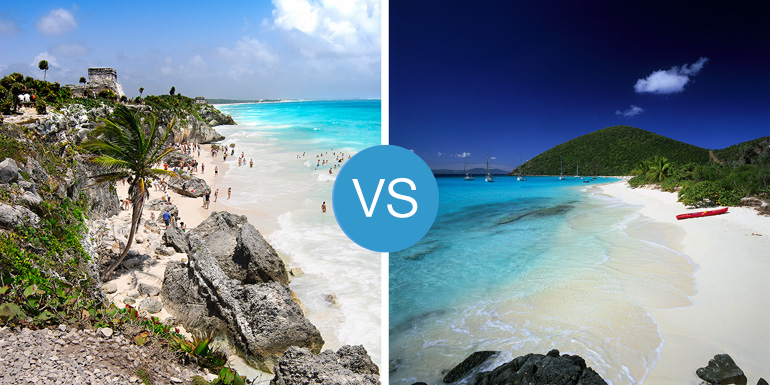 Which Caribbean route do you prefer? Many good points on both sides. If safety is a concern (and it shouldn't be a MAJOR one) then, in my opinion, less problems on Eastern itineraries. Anywhere there is a major port there will be some safety issues as tourists are irresistible targets. The poorer the country--the less tourism money reaches the actual population--the more there will be crimes of opportunity. Visitors have been dying in the Bahamas, Yucatan and Trinidad since the 1600s. Few tourists actually experience any of Haiti's impoverished people and landscape. Would you risk malaria to go fishing at Cap Hatien? We have never done the Eastern Caribbean cruises yet. So much more to do when in port in the Western that we always stay Western. Rating beaches in Western is interesting because the various ports offer differing sands. Your review is helpful and appreciated. I have only been on Western Caribbean cruise. Planning an Eastern Craibbien Cruise next year. I do Western more because of geography I am closer to ports that do Western. I thank it depends on what you want. I like activities get bored if I set on the beach to long, and few local souvenirs alright. Not big on shopping either. I hear snorkeling and scuba Diving is still amazing on the eastern Caribbean. Also I read that there are 7,000 Caribbean islands of course not all are inhabited by humans, in this included all of the Caribbean not east and west. So you could island hope for years never see it all.